Reading Tarot from the book only gets you so far. When you read Tarot from the heart and trust your intuition, your readings will be deeper, more meaningful, and more fun. 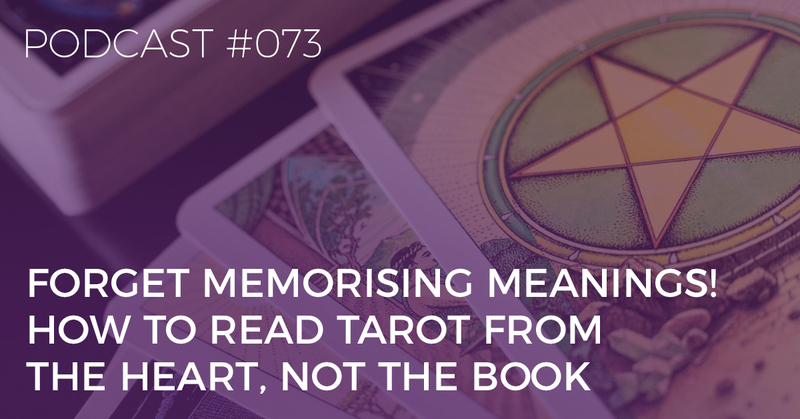 You’re listening to the Biddy Tarot Podcast, and this is Episode 73: Forget Memorising Meanings! How to Read the Tarot from the Heart and Not the Book. Hello, and welcome back to the Biddy Tarot Podcast. Today, we’re going to be talking about how to start the tedious job of memorising Tarot card meanings, and instead, how to start reading from the heart. But before we get into it, I want to say a big thank-you to everyone who sent in a review via iTunes and shared their feedback and comments. Awesome. Well, I am so glad I can support your journey from the get-go, FreckledWings. 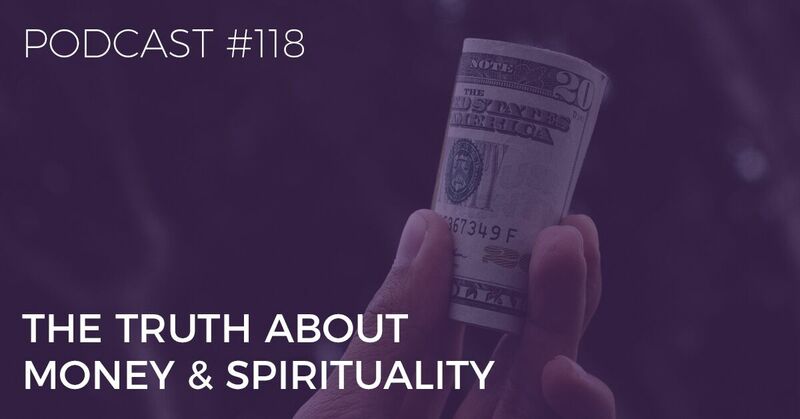 This episode in particular is probably going to be really helpful for you and for many beginner and aspiring Tarot readers. Thank you so much for leaving that feedback, and of course, if you want to leave your feedback, jump into iTunes, and you can leave a review and a star rating as well. I would appreciate it so very much. I read my Tarot books over and over and over, just as I did at university. I read the same lines, the same definitions, the same meanings, until they were absolutely burnt into my memory. And picture this: I had flashcards everywhere, keyword cheat sheets – all sorts of things to help me remember the Tarot card meanings. I did a great job of remembering the meanings, but here’s the problem: whenever I went to do a reading, they were so robotic, and I couldn’t really translate the meanings that I had rote learnt into the specific questions. For example, I would be single and asking about if I would find a new romance, and then I would get the Eight of Pentacles. “System reject! System reject! Don’t know what this means!” Because what I had learnt of the Eight of Pentacles, I couldn’t translate that into a love reading, for example. So, I put the book down. I opened my heart. I opened up my intuition, and I read the cards from my heart, and the result was much better readings – readings that just sang to me. I’d lay down those cards, and I’d see the story just leaping off the cards, so many messages and feelings coming to me more intuitively. Those kinds of readings were way more insightful than the repetitive, robotic readings that I had learnt how to do by memorising the cards. Today, I’m going to be talking with you about how you can read from the heart and not just the book, and I’m going to walk you through five things that you can do or things to keep in mind as you forget about memorising and instead you read from the heart. Here’s the thing: You have to believe that you can read Tarot intuitively, and I also want you to know that every single person can be intuitive, if you choose to do so. Intuition is not something that you’re born with. Well, maybe you might have a slight predisposition to intuition, but just because you weren’t born completely psychic and intuitive doesn’t mean that you can’t be now. For me, I really believe that intuition is something that you open yourself up to as you progress through life, and you do so by setting your intentions and making a commitment to being more intuitive and listening to your intuition in your life. You’ve got to believe that you can do it, and you’ve got to commit to doing it. Now, I know that it’s so tempting sometimes to want to rely on your Tarot books when you’re doing a Tarot reading, and you might start thinking, “Oh! My intuition? I’m not sure about that anymore! I’d better just check in my book to make sure!” It’s really important that you set your intention now, and you stick to it. Repeat after me: I hereby solemnly swear I will read Tarot from the heart and not just the book. I will stop trying to memorise the Tarot card meanings, and I will start trusting my intuition to create a personal and intuitive connection with the Tarot cards. So be it. There you go. You’ve set your intention, so now what happens? Well, here’s the second thing I want you to do. That’s right – step away from the book! Put it away. Now, here’s the thing with Tarot books. I think Tarot books absolutely play a role in you learning how to read Tarot. In fact, I still refer to Tarot books now, but the difference is I’ll use Tarot books in between readings. I use it more as an information source, a way of expanding my knowledge, expanding the way I see things. If I’m working with a new Tarot deck, I’ll look at the Tarot book in between the readings to get an understanding of the essence of the card. But when I’m doing a Tarot reading (and when you’re doing a Tarot reading), put the book down. Instead, you want to be able to read the cards intuitively. By putting that book down, putting it away from you, you just won’t be tempted to try to pick it up and go, “Oh, what’s in there? !” Or try to validate “I think it’s this, but I’d better just check the book in case I’m wrong.” So put the book down, put it away, and only once you’ve gone through that process of reading the cards intuitively, if you feel it would serve you well, then, yes, have a look in the book, but I want you to read intuitively from the get-go. Here’s how you can do just that. It’s really important before you do a Tarot reading, particularly if your intention is to do it intuitively, you need to create a sacred space for that Tarot reading to occur. Don’t worry – you don’t have to be burning incense or saying incantations or calling in all the directions. Look, you can if you want to, and if you feel like that’s what creates the sacred space for you, go for it. Do it. It’s beautiful. But I want this to be simple and easy for you as well. Creating the space can be as simple as breathing and clearing your mind, and this is a technique that I’ve talked through in previous podcast episodes, but basically, you close your eyes, you take in your first breath and on the exhalation, you’re just letting go of any tension. Then, on the second breath in and the exhalation out, you’re bringing yourself into the present moment. And then, on that third breath when you exhale, you’re opening your mind to receive whatever it needs to receive. It’s a very simple way of just getting into that beautiful, intuitive, sacred space so that then your reading will flow from there. Forget all of that, because that’s your memorising stuff coming through. I want that to stop for the moment, and instead see what comes to you intuitively. Gaze at those cards and pay attention to what you hear. Are there words? Are there phrases that you hear? Are there sounds? Songs? Music? Whatever it might be. Is there something that you see? Now, it might be something that captures your eye in the Tarot cards, and you say, “Oh, there’s a Moon! Oh, there are two Moons! That’s very interesting.” What does the Moon signify for me right now? What role is the Moon playing for me? But you might also see on more of this intuitive (or even psychic) level. Example: You might see the cards physically in front of you, but you start to see new imagery in your mind’s eye about a particular situation or an event, so pay attention to that, because that is your intuition doing the talking. You might also feel something. Maybe a physical sensation in your body, or you feel an emotion in your body, something energetically, even. Maybe even smell something or taste something. Really pay attention to your senses as you are looking at those cards, just taking in whatever intuitive message is coming to you. Now, what I love about getting into the stories… When you start looking at Tarot cards as stories, that’s when your intuition can really kick into gear, because instead of tapping into really static Tarot card meanings that you’ve learnt or memorised from a book, what you’re doing is you’re looking for a more dynamic meaning. You’re looking at this picture in the story in the card, and you’re seeing what comes up for you in that moment in time. For example, the Knight of Cups. I was doing a Tarot reading for a client, and she was asking about an ex-partner, whether there was really any chance of them getting back together. I laid out the cards, and one of the cards was the Knight of Cups. Look, if I had been memorising the meanings, I’d have gone, “Hmm, Knight of Cups – romance, an offer,” or something along those lines. But what I did was I looked at the card, and I started to look at the story in the card. I looked beyond just seeing the Knight on his horse, looking very charming and romantic. In fact, I started to look at the background. My attention was drawn to the background, where it was a desert with this bright blue river running through it, and what came into my mind’s eye was this idea of a desert oasis. I started thinking, “Oh wow, I think maybe this man that she’s interested in isn’t spending time with her, but he’s spending time in some kind of desert oasis with another woman.” I put it out there. I said, “My goodness! That’s amazing!” and that was all because I went past just typical meanings of the cards, and I went into what story I saw in that card, what imagery took my attention. I want you to really look through the card. Look beyond what you know of the card, and look intuitively into the card. There’s a practical way of doing it, and that’s telling the story in the card. You start by saying what’s happening in the card. What characters are in there? What’s the object that you’re seeing? What’s going on?” And then start to ask yourself, “OK, well, that’s interesting. Now, why is that happening? What’s really going on here? What’s the real story behind this card?” You start telling that story, and then you ask, “OK, how does that relate?” and you might start to realise that that card is actually related to your life in ways that you could never have seen. Now, I’ve just reached over to grab my little Tarot, because I want to just randomly select a card here. Ten of Wands. Maybe I’ve asked about what’s coming up for me in the next week. What I see here is a man carrying a pile of sticks, and he’s kind of bent over. In fact, it looks like he’s defying gravity here, because these sticks are pulling him down, and he’s carrying them in a very awkward way, actually. They’re kind of splayed out. There’s probably a much easier way to carry these sticks, but he’s bending over, and his back is really hurting. In the background, I’m seeing the little house. He doesn’t have that far to go, but… You know, you’re in the moment of the burden, the pain, and sometimes even though you’re getting to the finish line, you’re getting to home, you’re so in that moment of pain. This is kind of the process here. I’ve talked about what’s happening, so why is this happening? Well, maybe he’s taking it on himself. Maybe if he thought about this situation a little bit better, he could actually get a bit more organised and figure out how to carry these sticks in a better way. He might even pay more attention to his posture, so he could have a straighter back while he is carrying those sticks, and that might make it easier. It’s almost as if he’s fallen victim to what’s happened here, and he’s making it even harder for himself. I wonder: How does that relate to me in my week that’s coming up? Well, maybe I could think about what I am taking on and that I’m doing in such a way that’s creating even more pain for me than is really necessary? Maybe, if I could just put these sticks down for a moment, I could stop, assess the situation, and evaluate. What’s the best way for me to get this heavy pile of sticks to my destination? Maybe there’s a better way that I’m not seeing right now, because I’m so in the moment of the pain and carrying heavy sticks. What’s happening here just as I’m looking at this card is I’m going beyond the meaning that I might memorise in a book, but I’m going more into the story, and I’m just paying attention to what’s coming up for me right here, in this moment, and the story that I’m starting to see in this card is helping me to intuitively connect and respond to the question that I had with the Tarot card. That is such a simple way of getting your intuition to kick into gear so that you’re not just relying on book meanings when you’re interpreting the cards, and I think you’re going to surprise yourself and the people that you’re reading for, because you get into such specific detail, it becomes so relevant to the person that you’re reading for, and it’s not just “Ten of Wands – heavy burdens.” You’re actually getting into how this really relates to you as well. OK, I’ve spent a lot of time on that, but I find that the story in the card is incredibly important. Again, this is what’s going to get you away from memorising the meanings and closer to reading intuitively and from the heart. Journaling with the Tarot cards is such a beautiful process, and I find that it helps to really facilitate your soul journey and your soul healing. Reading with the Tarot cards, doing an actual Tarot reading is just one way of working with the Tarot cards. Things like journaling or doing creative projects with the Tarot cards just takes your intuitive connection to the Tarot cards that much deeper. You can actually work with the Tarot cards with your journal on a daily basis. You could pick just a random card and journal about it. Maybe you’re going through the steps that we talked about before, where you’re just seeing what energy you’re getting from this card, what’s coming up for your intuitively, and what’s the story, and how that story relates to you right now. You might just pick a card for the day and free write. Just write whatever comes to you intuitively. Or you might even take it that little step further, because when you’re looking intuitively at the cards, you notice the veil, and the veil sits behind the High Priestess. “What side of the veil am I on, and why am I on that side? What might happen if I was on the other side of the veil? What lies beyond the veil?” Things like that can be just so juicy to start journaling about. This is stuff that you will never find in a Tarot book, and yet the value of these insights can be so deeply personal and moving for you. 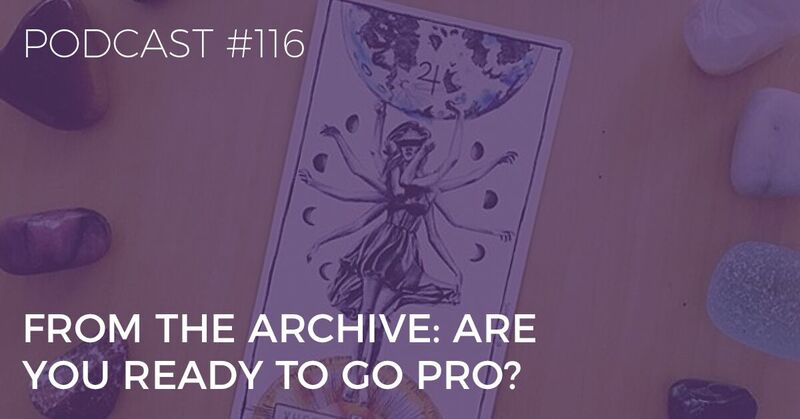 In fact, once you go through the experience for yourself, where you’ve gone quite deep into these cards, then imagine what you can help create for the people that you read Tarot for. You could start using some of your experiences to help shift the energy for somebody else, or to help pose different questions for someone else to see life in a different way. Journaling with the Tarot cards is a beautiful way to really make it personal and to learn the cards at a heart level, where you fully embody the card, you get it, and it’s intensely personal, but also in such a way that you can then go and share that with others in a really powerful, meaningful way. There you have it. Those are five steps that you can use to read Tarot from the heart and not just the book. Set your intention to read Tarot intuitively. Put the book down, especially when you’re doing a Tarot reading. Read the cards intuitively first. Notice what comes to you intuitively when you’re looking at the cards. Interpret the story in the card, and get to what that story really means for you on a personal level. Finally, journal with the Tarot cards. Find that deeply personal, intimate connection with the Tarot cards. Once you start doing this, this is how you make Tarot fun. You’re going to get so much more out of your Tarot readings when you’re reading from the heart and not just the book. You’ll connect more with your inner wisdom, and instead of relying on others for your advice, you’re going to know, “I can go internally. I can get my answers from within, because I trust my intuition.” And ultimately, you’re going to be able to learn Tarot faster. This is way more interesting than memorising and rote learning. When you make it deeply personal, or you just simply learn how to tell the story, then it facilitates that learning process so much more. I’m hosting a FREE training: How To Quickly Read Any Tarot Card Intuitively Without Memorising All 78 Cards. Keys to master the Tarot card meanings quickly!